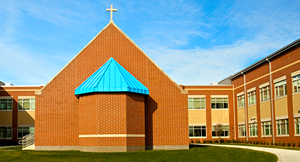 The award-winning Riverside School in the Hamilton Southeastern Schools district includes three gymnasiums, an auditeria, and cafeteria. The school was designed for maximum flexibility to accommodate various school and after-school activities. Building was completed in two phases, with Phase I focusing on the grades 7-8 wing, and Phase II focusing on the grades 5-6 wing. The main corridor serves as the buildings spine and primary shared space, with recreation areas, dining facilities, and a three-story academic house. This space houses areas for a variety of student programming, including a music suite, lecture hall, video production lab, and a media center.